Released in 2016 Teddy Clown replica is a limited edition of only 926 pieces. Between 1926 and 1928, 30,000 Teddy Clowns left Steiff's workshop – all of them with black pompons and ruffs of blue, red, orange or purple. 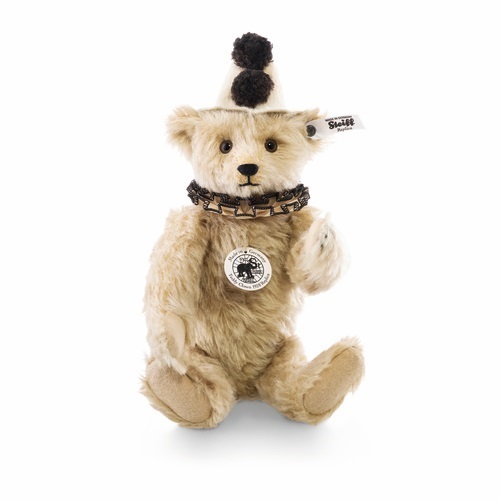 A good 90 years later a Teddy clown with black pompons and a black ruff pops up in Southern Germany! So Steiff is rewriting a bit of Steiff history – and is showcasing the Teddy clown replica 1926. 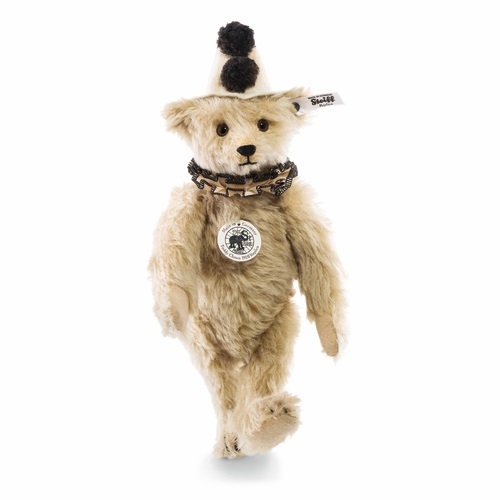 The bear is made out of delicately sculpted, decorative mohair features and is stuffed with soft wood shavings. The back of his glass eyes are painted dark brown. To match his felt hat with handmade pompoms he is wearing a pleated ruff. In his ear an "underscored-button” made of patinated steel. And he beguiles you with his clownish behavior, just as before.